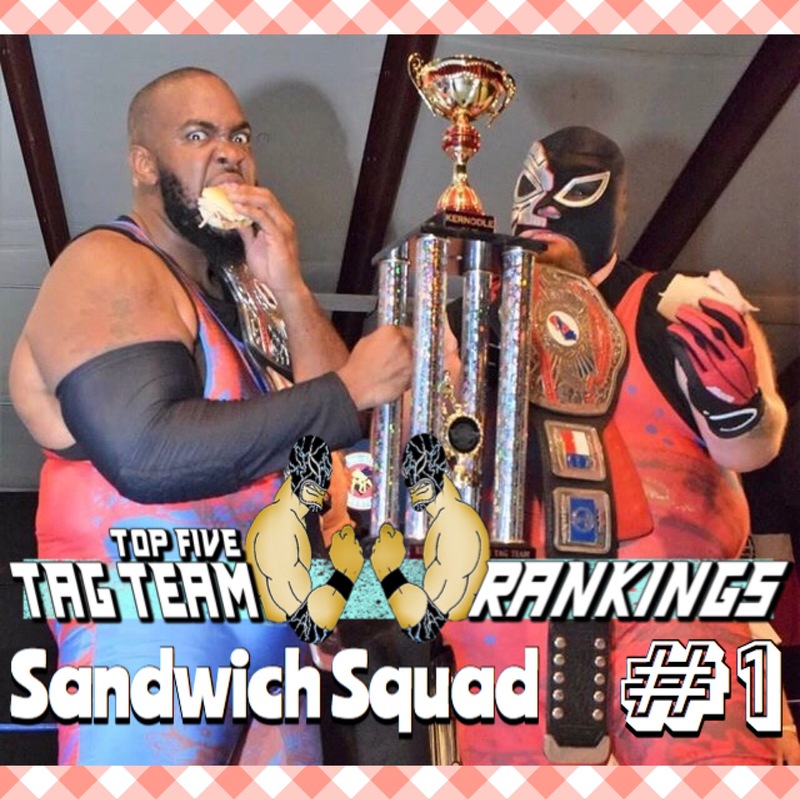 #1 The Sandwich/Sammich Squad (Aaron Biggs & Mecha Mercenary)-The official vote wasn’t even a contest this week as the winners of the first-ever Kernodle Brothers Tag Team Tournament swept the official voters’ ballots at #1. They defeated The Dirty Blondes (Leo Brien & Mike Patrick) at CWF Mid-Atlantic on 3/24, then defeated Cain Justice & Tripp Cassidy on 3/25, then defeated The Carnies (Kerry Awful & Nick Iggy) the same day in the semifinals, and then defeated The All Stars (Arik Royal & Roy Wilkins) in the final to win the tournament to go 4-0 for the week. It was an absolutely dominant week for the Squad as they beat several of the best tag teams on the indies right now to earn their first #1 ranking. Look out for this team as CWF Mid-Atlantic generally plays a big role in our tag team rankings. 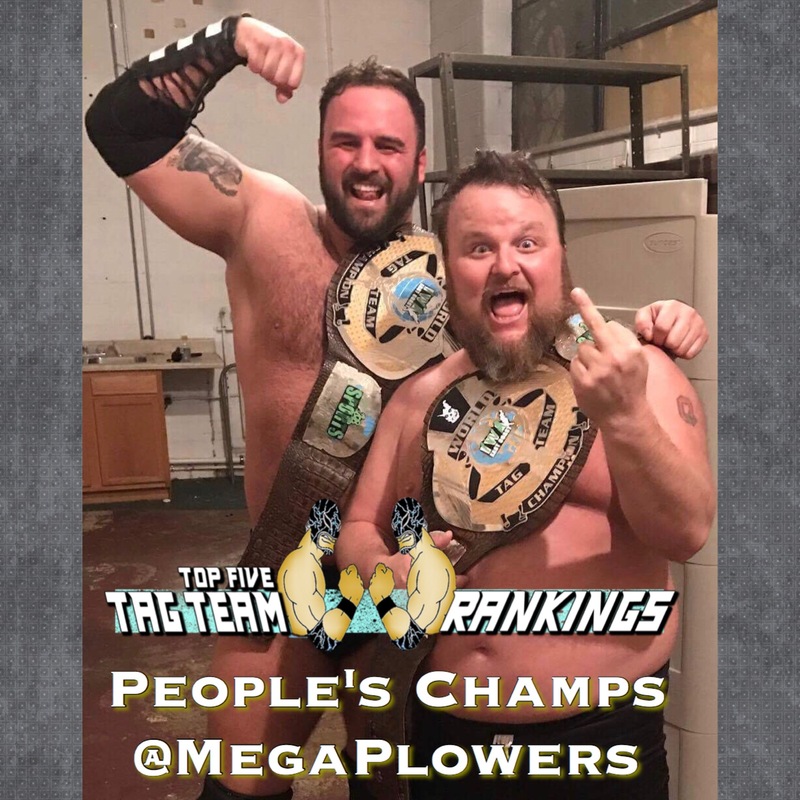 #2 The Carnies (Kerry Awful & Nick Iggy @TheCarniesTN)-Last year’s #1 in the Tag Team Top 50 are BACK in the Tag Team Top 5 this week after having a damn good week doing the loop around the indies. First, they beat the Lynch Mob (Joey Lynch & Matt Lynch) at CWF Mid-Atlantic on 3/24, then teamed with Ace Perry, AJ Gray, Dirty Daddy, Ethan Alexander Sharpe, Nick Richards & Sisthe same day to defeat Him, Johnathan Wolfe, Kris Main, Leo Brien, Mike Patrick, Shawn Kemp, Sweet Dee & Tripp Cassidy, then defeated Ethan Alexander Sharpe & Mike Jordan on 3/25 by DQ, and then lost to The Sandwich Squad (Aaron Biggs & Mecha Mercenary) the same day to go 3-1 for the week. 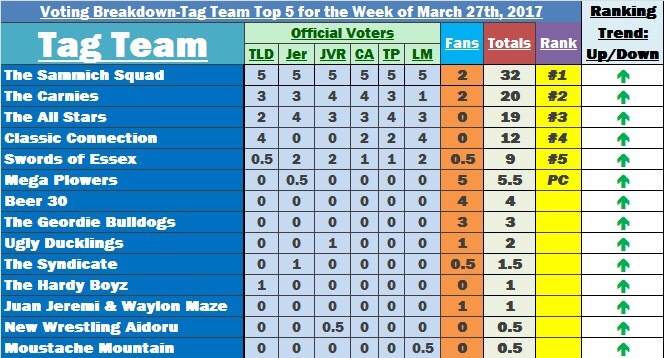 Their only loss over the weekend was to this week’s #1 and there’s no doubt that their reputation as a top tag team helped them into the #2 spot this week. #3 The All Stars (Arik Royal & Roy Wilkins)-This week, CWF Mid-Atlantic is essentially responsible for the three top tag teams in the Tag Team Top 5. This team who we’ve seen before in the Top 5 defeated Mitch Connor & Nick Richards at CWF Mid-Atlantic on 3/24, then defeated So Time’s (Dirty Daddy & Snooty Foxx) on 3/25 in the quarterfinals, then defeated The Ugly Ducklings (Lance Lude & Rob Killjoy) in the semifinals, and then lost to Sandwich Squad in the final to go 3-1 for the week. They came JUST short of ensuring they’d be the #1 tag team this week by winning the first annual Kernodle Brothers Tag Team Tournament, but fell to the #1 The Sandwich Squad. So #’s 2 and 3 this week in the rankings have one thing in common…they lost to this week’s #1 tag team. #4 Classic Connection (Buddy Royal & Levi Shapiro)-It was a GREAT week for this tag team who probably would have been ranked even higher if we were able to find the results sooner. That said, the Gold Rush Pro Wrestling, NEW All Pro Wrestling Tag Team, and NEW Big Time Wrestling Tag Team Champions had a phenomenal week as they teamed to defeat Chaos Inc (Synn & Tony Vargas) at Big Time Wrestling on 3/24 to win their titles, then defeated Lion Power (Marcus Lewis & Will Hobbs) at All Pro Wrestling on 3/25 to win the titles, and then defeated PAC 3 (Dan Joseph & Dicky Maier) at Championship Wrestling from Hollywood on 3/26 to go 3-0 for the week. We hope to see more of them as on any other week, they likely would have been #1 in the Top 5. #5 The Swords of Essex (Will Ospreay & Scott Wainwright)-The WCPW World Tag Team Champions get into the Tag Team Top 5 on the strength of one HUGE victory over the weekend as they defeated The Young Bucks (Matt & Nick Jackson), Prospect (Gracie & Archer) and Liam Slater & Matt Riddle in a four-way tornado tag match at WCPW on 3/20 to retain the titles. This is a team that we’ve seen multiple times at or near the Tag Team Top 5 and the victory over some VERY talented teams really helped them into the #5 spot this week despite other teams with very good weeks. With the WCPW World Tag Team Titles still around their waists, look out for them to continue this success as the year rolls on. 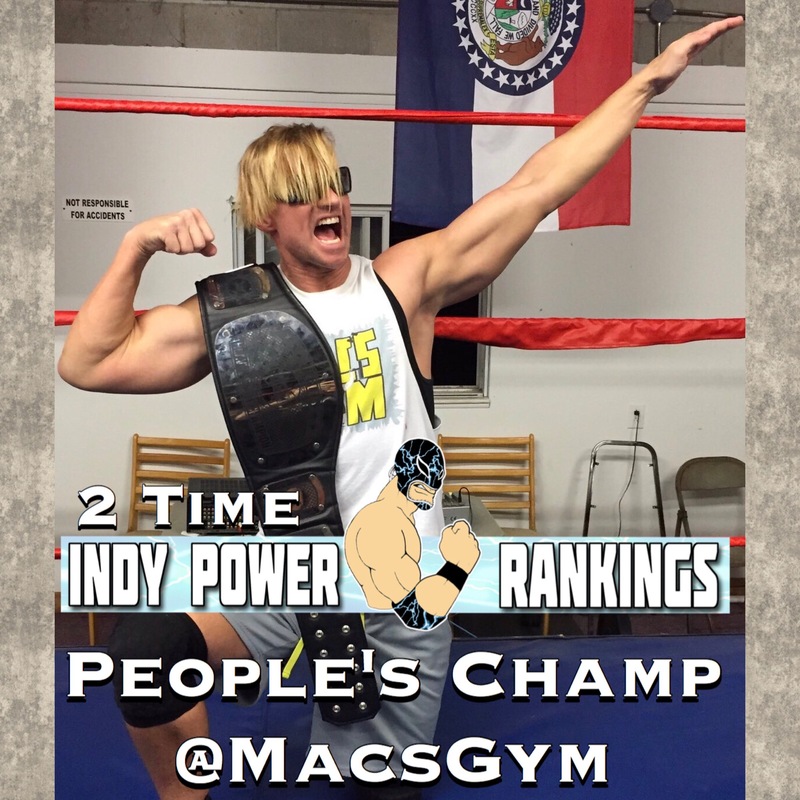 #1 Jax Dane (@TheJaxDane)-Once again, a tournament plays a big part in determining who is #1 in the Indy Power Rankings. This week it’s Jax Dane as he defeated Jordan Kage at AML, then beat Eliott Russell, Drew Galloway, and Houston Carson to win the AML Big Man Bash Tournament over the weekend. It looked as though Galloway had the #1 spot wrapped up this week until he ran into Jax Dane and lost in the second round of the tournament. 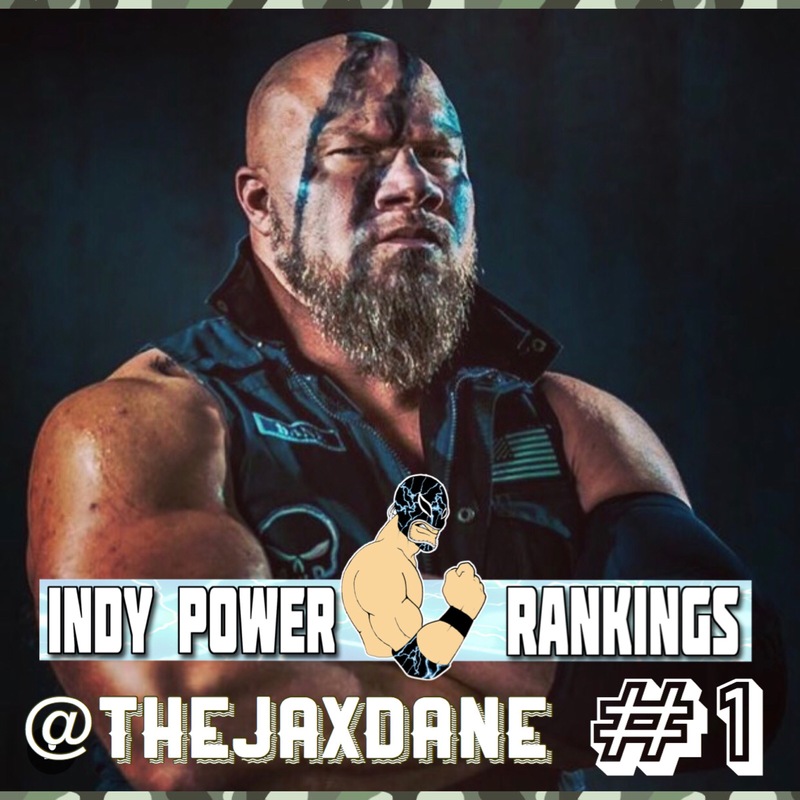 Jax Dane had been known in the Indy Power Rankings primarily for his successful tag team with Rob Conway, but now he’s really starting to show what this powerhouse can do on his own. #2 Christopher Daniels (@facdaniels)-It’s rare that the ROH World Champion gets a spot in the Indy Power Rankings due to us not ranking ROH as an independent wrestling promotion anymore. That said, Daniels had a great week outside of ROH as he took his ROH World Title to WCPW where he beat Zack Sabre Jr. and Adam Cole in a Three-Way to retain the title on 3/20 and then beat El Ligero on 3/21 to go 2-0 on the week. Daniels beat four of the talents anywhere on the indies today and with all of the prestige that comes with his name and title, he was a lock for a high ranking this week. #3 Drew Galloway (@GallowaySpeaks)-Galloway came oh so close from getting yet another #1 ranking until he ran into Caleb Konley and Jax Dane. That said, he had an absolutely phenomenal week despite not getting the overall #1. The WCPW World Champion beat Joe Coffey on 3/20 to retain the title, then beat Ricochet on 3/21, then beat Mark Coffey on 3/23, and then defeated BT Gunn the same day. He came back to the U.S. and lost to Caleb Konley at AML, then beat Sean Studd at AML in the Big Man Bash Tournament before losing to Jax Dane to finish off his 5-2 week. Galloway is still seeking another elusive #1 ranking, but he’s having a good year so far regardless. #4 Reptil-This is a name we haven’t seen in the Indy Power Rankings yet, but he earned his spot as he won the Imperio Lucha Libre South American Title after he beat Jhoan Stambuk in the first round of the title tournament in Peru on 3/25, then beat Chavo Guerrero Jr. in the semi-finals, and then beat Matt Sydal & Zack Sabre Jr. in a Three-Way final to win the vacant title with a 3-0 record for the week. With some of the names he beat, it’s amazing he wasn’t even higher this week, but him being a relative unknown may have slightly hurt him when stacked up against the likes of Daniels and Galloway. Keep an eye on him to see if he can continue this momentum as 2017 rolls on. 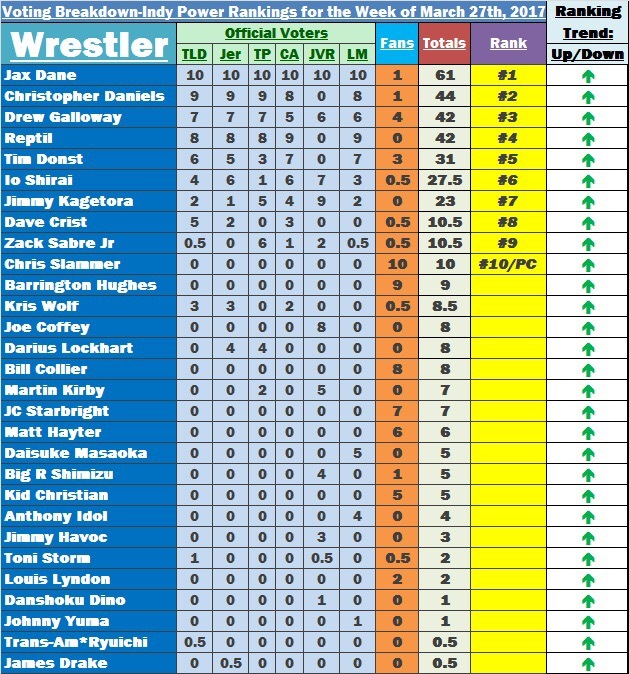 #5 Tim Donst (@tdonst)-Tim Donst becomes the only person in the Top 5 this week who only one match (that we know of) over the weekend. Despite winning only one match, it was a HUGE one as he won the AIW Absolute Title, defeating Josh Prohibition and Tracy Williams in a Three-Way to win the title on 3/24. This came after the match originally ended in a double pin, but was restarted. Donst has been ranked before, but it’s been a while, so with this important independent title around his waist now, he looks to add some consistency in the upcoming weeks and months. Who should be #1 in the Tag Team Top 5 for the Week of 3/27/17? Winner of the online voting competition are “People Champs” for the week AND helps their overall ranking! There is no award for second place but all votes that come in add to the tag team’s final ranking so vote away! “The Governor” Martin Stone defeated “The Product” David Starr via submission in the first ever ‘Pure’ Rules Match. Under ‘Pure Rules’ each man is only afforded 2 rope breaks and their are no closed fist punches allowed. Premiere Wrestling Xperience returns to Hickory, North Carolina Sunday April 30th for ‘Enter The Dragon’ featuring rEDragon Kyle O’Reilly & Bobby Fish! Visit pwxpro.com for all the latest info! 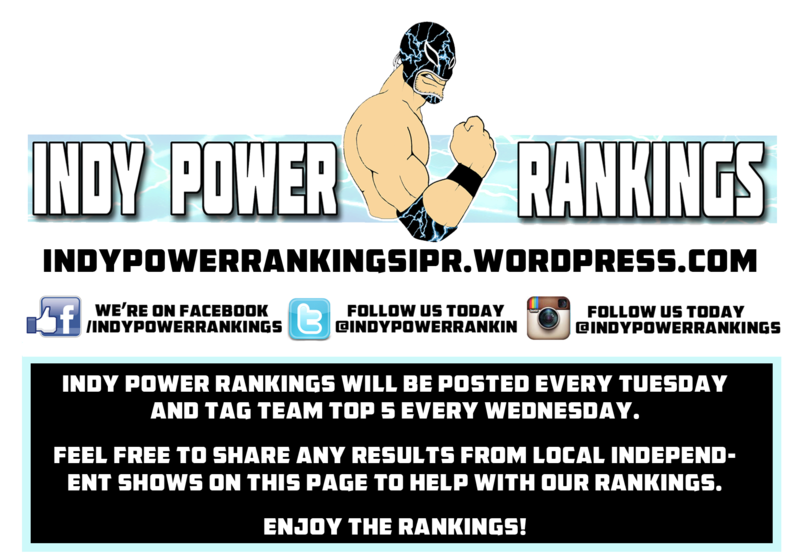 Who should be #1 in the Indy Power Rankings for the Week of 3/27/17? CWF Mid-Atlantic Tag Team Champions The Sandwich Squad (Mecha Mercenary & Aaron Biggs) defeated The All-Stars (Roy Wilkins & “ACE” Arik Royal) w/ Coach Gemini to retain the titles & win the Kernodle Brothers Tag Team Cup.